Indidoll Mani's dress is inspired by Rani lakhmi bai. Festive Purple kurti has pearl neckline and Zari on the sleeves, and pink lehenga has Zari border. 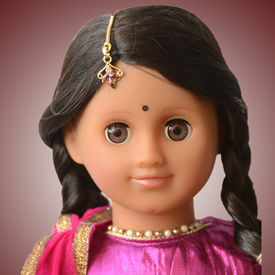 Mani Doll Package (Festive Pink and Purple Lehenga) contains the following: 1. A beautiful collectible 18" doll with 19th century period Mani dress wearing a shoes. Indidoll Mani's dress is inspired by Rani lakhmi bai. Festive Purple kurti has pearl neckline and Zari on the sleeves, and pink lehenga has Zari border. 2. A colourful illustrated Mani book with a story of adventures of Mani.